Size: 10.75 x 13.25 inches. Title: 'The World in Hemispheres with other Projections'. From Mitchell's New General Atlas. 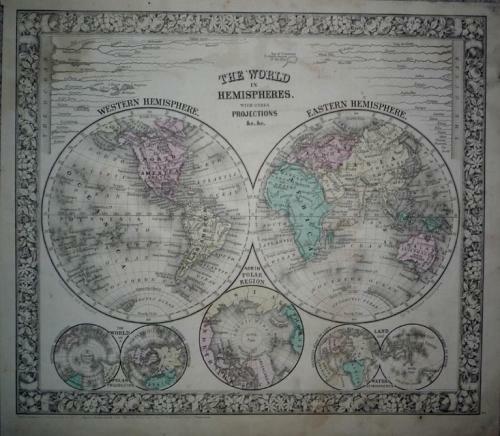 An 1860 map in original wash colour of the World showing the two Hemispheres with inset of views of the Polar Projection, North Polar Region and the Land and Water Hemispheres. This is a classic Mitchell map with the decorative floral border style that is much sought after from maps of this period. Of note: Alaska is Russian territory and many areas of Africa and Australia remain unexplored. The map is in good condition with toning in the margins.